Produced by Ben H. Allen (Gnarls Barkley, Animal Collective, P-Diddy, Christina Aguilera) and All The Saints. Psychedelic yet direct, raging but tuneful, All the Saints' debut LP Fire On Corridor X bulldozes preconceptions at volume. Named after a section of the I-22 highway connecting the trio's native Alabama to Mississippi, the cryptic title track is a hypnotic mind-meld of their primary influences, welding a Loop-sized space-groove to The Gun Club's lyrical bite. "That song is about where we grew up," explains singer and guitarist Matt Lambert. "I try to have a little bit of where we're from in everything we do, without flying rebel flags and playing alt-country. The paradox of our band is that we're from the South, but you'd never be able to guess." Lambert, bassist/co-vocalist Titus Brown and everybody's soon-to-be fave new drummer Jim Crook moved to Atlanta in neighboring Georgia in 2004, attracted by the bohemian state capitol's liberal atmosphere ("it's the New York of the South") and a fertile music scene that has spawned the likes of Deerhunter and Black Lips. All The Saints came into existence a year later, their moniker inspired partly by an old Verbena song and partly by an outsized fleur-de-lis saints symbol which a tramp had spray-painted gold and sold to the nascent combo at one of their early gigs. This duality is carried through album stand-outs 'Sheffield' and 'Leeds', which highlight the group's impressive range. The former is a controlled acid bath, brimful of scathing asides about small town attitudes and repression ("empty your church for a while"). The latter wraps its guarded existentialism in a gently reverbed jangle, cut in one-take on a six dollar acoustic guitar Lambert purchased from a thrift store. "Leeds and Sheffield are both cities on the interstate in Alabama," notes the committed Anglophile, who was turned on to My Bloody Valentine, Ride and The Jesus And Mary Chain by an indie radio station his elder sister used to tape in the early '90s. "We'd see these signs on the drive to Atlanta and realize that they also correlated with cities in England." The hulking riffs and accusatory tone of de facto theme tune 'Regal Regalia' - which, with its towering "All the saints!" refrain, was the first song the band wrote together - and whirlwind twin 'Papering Fix' blend their forebears' dissonant sonics with meaningful text and emotion. All the Saints show that it's possible to touch souls at the same time as blitzing synapses, their front man reflecting that with many of his lysergic inspirations "the tones and the vibe are so dead-on, but sometimes the lyrics can be very secondary. I'm not saying we're Bob Dylan or anything, but we're trying to blend this music with lyrics that people can connect to." To achieve this goal, they hunkered down in local studio Nickel & Dime for a fortnight in April 2007 with producer/engineer Ben H. Allen (Animal Collective, Gnarls Barkley), mixing through summer and finishing up by October. Allen's hip hop background belies a keen understanding of what fires a nuanced modern rock band. Blown away by a wildly dilated live show the previous winter, he encouraged the musicians to hone their epic ideas into laser guided melodies. Hence the near seven minute Outs alternates its churning, tidal-axe tumult with a graceful piano reverie. As Lambert recalls: "Ben said that if you're going to take somebody to the wonderland, you gotta sprinkle some pixie dust along the way." 'Fire On Corridor X' delivers that focused magic in spades: a seamless yet dynamic set that demands to be played loud and often, revealing more with each stereo-engulfing, brain-rewiring spin. See their Myspace page at http://www.myspace.com/allthesaints for streaming songs, videos, and live dates. This Ben H. Allen-produced debut hits upon a few rock touchstones du jour: squall, feedback, sharp edges so muddled by sonic ballast they blur, warp and peel like paint succumbing to humidity. But unlike many of their contemporaries, All the Saints' use of noise is more an exception than the rule. Only the album's brief, velvet-clad intro piece, "Shadow, Shadow," suggests the band is no more than the latest act to re-discover My Bloody Valentine's Loveless. But bleeding into the swirling, psychedelic stomp-and-howl of "Sheffield," the opening minute of peace and haze is nullified entirely. The trio relocated from Alabama to Atlanta, and Fire On Corridor X is heavy with Southern, small-town angst (with lyrics like "empty your church for a while") and the feel of hot, sweaty summers-- particularly on the unhinged and unstoppable title track. Both it and the stormy, chanting "Regal Regalia" use noise as a means of rebellion, rather than jammy, chin-scratching flourish or a way to get into hipster girls' skinny jeans. Not that there's anything wrong with that; it's just that there are different ways to wield these tools. And with Fire on Corridor X, All the Saints seem less interested in renovating the house that noise built than burning the whole thing to the ground. Atlanta's All the Saints may start in a shivery atmosphere of Mogwai-ish guitar, piano and drums (the brief, evocative "Shadow Shadow"), but they quickly move to obliterating churn and drone. They may name two songs after historic synth pop ("Sheffield") and post-punk ("Leeds") capitals, but they are firmly grounded in the Manchester aesthetic of guitar distortion. Yet unlike label mates--and fellow feedback aficionados--A Place to Bury Strangers, All the Saints embedded a near metallic splendor into their fierce drones. You can hear bits of Black Sabbath and Led Zeppelin in their shimmering sheets of sound, alongside echoes of all the usual Northern UK suspects, Stone Roses, Joy Division and My Bloody Valentine...as well as their American followers in Black Rebel Motorcycle Club. 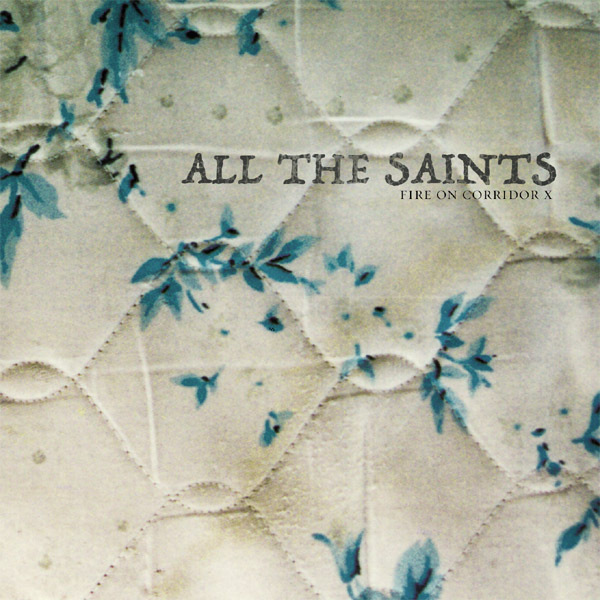 Fire on Corridor X is the All the Saints' first full-length album, following on a seven-song EP released. The band--guitarist Matt Lambert, bassist/singer Titus Brown and drummer Jim Crook--all grew up together in Alabama, but only formed a band a few years ago when they all met up in Atlanta. Yet for an early effort, Fire on Corridor X is remarkably cohesive and varied, its more pensive interludes ("Shadow, Shadow", "Hornett") leading inexorably into pounding, riff-bending onslaughts ("Sheffield", "Papering Fix"). "Leeds" is even a sort of folky, acoustic campfire song, yet it fits without a glitch between Sabbathy "Papering Fix" and the epic, slo-mo title track. The songs elide into one another, with the cut breaks often fairly arbitrary, a slow drone ending one song and introducing another. As a result, despite the variety of songs, the album has a very coherent shape and progression to it. It feels like a well-thought-out live performance, or even a long composition with movements. A few cuts, however, stand out, the loud ones in particular. "Farmacia" is a codeine-furzed, psychedelic drift, its hazy vocals billowing over magma eruptions of distortion. With "Sheffield", the drums break loose, a tidal surge of tom rolls and cymbal clashes under the stately melody. And "Regal Regalia" slips a bit of daydream between pummeling eighth-note barrages of guitar. It's a manifesto of sorts, the band's signature blend of vocal tranquility and ear-bleeding aggression on display, the band's name incorporated into the chorus. If you had to pick only one--and that would be a shame--this is it. Fire on Corridor X was produced by pop mainstay Ben Allen, best known for his work with Gnarls Barkley, Animal Collective, P-Diddy, and Christina Aguilera. He is responsible, apparently, for the extreme clarity of this recording, an approach which does not exactly contradict All the Saints' storm and clangor, but rather brings all its elements into focus. You can hear the vocals perfectly, for instance, in the feedback fuzzed "Regal Regallia", despite a floor-shaking bass and guitar riff that must be overwhelming live. The drums, too, clatter and surge with a distinctness, a legibility almost, that you can always hear and understand, but that never blots out the other parts. The lineup: Matt Lambert (guitar, vocals), Jim Crook (drums), Titus Brown (bass, vocals). The background: All the Saints are a three-piece from Atlanta who have been described as a metal Radiohead or the missing link between space-rock and grunge, between Spiritualized and Soundgarden. Actually, they sound to our ears more like Wish You Were Here-era Pink Floyd with Owen Morris at the controls, or Swervedriver, that early-90s Creation band who attempted, via dream-pop, to capture the widescreen, epic feel of a US rock band. Most of all they sound like Oasis if they'd been shoegazers. That's not as preposterous as it might first sound. You could tell, as soon as you heard Oasis' debut album Definitely Maybe and its immense wall of guitars, that Noel Gallagher had been listening to Creation label mates My Bloody Valentine. And you can tell that this Atlanta three-piece have been listening to both Oasis and the Valentines. It's got feedback, fuzz and an enormous droning intensity that is both anthemic and psychedelic. Despite the fact that their voices are treated and enhanced by a series of effects that makes them sound like they're singing from the wrong side of a wind tunnel, Lambert and Brown have the insouciant arrogance of the Gallagher brothers. There are even two tracks on All the Saints' debut album Fire on Corridor X called Sheffield and Leeds, and although they're named after cities in their home state of Alabama (they only recently relocated to Georgia), it's tempting to see them as paeans to the UK's other northern rock centres after Manchester (especially the goth stronghold that is Leeds, because there is a Mission-ary urgency to All the Saints' attack). Turns out we're not being too fanciful - ALS were turned on to haze-rock exponents like MBV, Ride and the Jesus and Mary Chain by an elder sister of one of the band, who used to tape a local Anglophile indie radio station in the early 90s. It's dark, driving drone-rock that sounds like it was made by young men not far from the depraved edge - and yet two of its creators, Lambert and Brown, were raised as strict Christians in the heart of the Bible Belt. That's the first surprise about Fire on Corridor X. The second is that it was produced at their local studio Nickel & Dime by Ben H Allen, most recently acclaimed for his work with Gnarls Barkley. There is no funk or hip-hop element to All the Saints' music but Allen has managed to give tracks like Sheffield and Hornett a cosmic, rhythmic groove-power that will cause the sort of violent head-nodding not seen since the heyday of Loop and Spacemen 3. The buzz: "Imagine if Radiohead were a hard-rock band with a more metal edge, or if Syd Barrett made a hard-rock record." The truth: This is what we imagined Kasabian's Empire was going to sound like. Most likely to: Cause a sonic boom. Least likely to: Cause Jason Pierce to get back in touch with Sonic Boom. What to buy: Fire on Corridor X is released by Touch & Go on November 17. File next to: Swervedriver, Oasis, Spacemen 3, Loop. Listening to the album, it's no wonder why great things "suddenly" seem to be coming All the Saints' way. Fire on Corridor X is a remarkably consistent and cohesive album, ten tracks cradled within a dense fog of reverb to create a hypnotic ebb and flow in all the right places. One minute you're floating in the delicate patches of "Hornett" only to be pummeled moments later by its Alice In Chains Facelift-era refrain. Staggered and woozy, it's best to just allow each successive track to wash over and gradually disarm you with the incredible rawness that runs throughout the record. "I tracked their MySpace page down. Before I could even rush to the speakers to turn the volume down I was completely blown away by what I was hearing. I wanted to know everything about this band. I wanted everyone I know to listen to this band and be amazed. There isn't a track on their album that doesn't warrant listening to." - KISSatlanta.